Originally published by Stevenson, Inc., this practical resource helps nonprofit organizations generate more endowment gifts. This resource provides step-by-step procedures to help build endowments, ideas and approaches to raise needed funds, actionable tips and techniques, and helpful charts, forms, and useful examples. 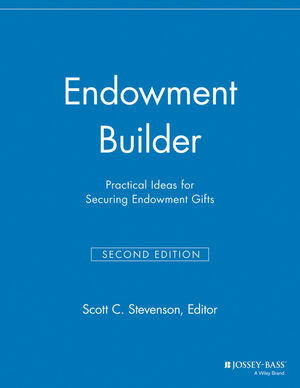 Scott C. Stevenson is the editor of Endowment Builder: Practical Ideas for Securing Endowment Gifts, 2nd Edition, published by Wiley.